Aquarius is an ultramodern 35' sport fisherman. She was custom designed & built specifically for the waters off Cape Cod. 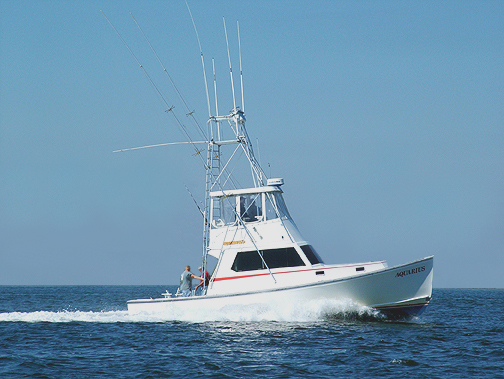 Her fully enclosed cabin and private, full stand up head insure you'll fish in comfort. She's totally outfitted with the latest in electronic navigation and fish finding gear as well as Coast Guard safety equipment and all the tackle you'll need. The captain of the Aquarius is a Coast Guard licensed operator with your safety as his primary concern. 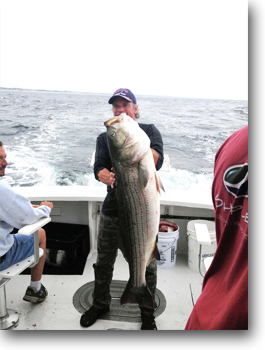 He has over 35 years of experience fishing the waters of Cape Cod. He has devoted the time to learn the shoals, drop-offs, weed patches and places to fish on all tides. 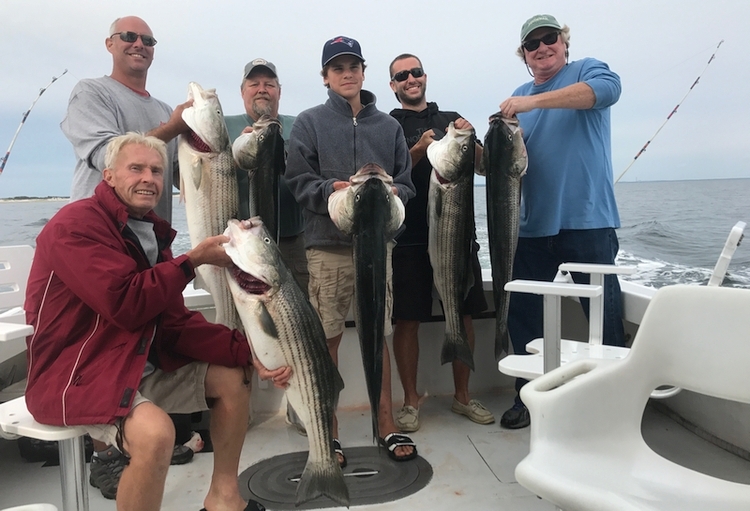 Whether fishing for trophy-size striped bass, elusive bluefish or giant school tuna, the captain pays strict attention to all tackle, gear and equipment necessary to make your day safe and memorable. Click here for current rates. If you have any particular concerns or preferences with regard to species, tackle, dates and times, just let us know and we'll do our best to accommodate you. An experienced mate accompanies you on every trip. He will do everything possible to make your trip successful and memorable. The mate's day starts early every morning to prepare the Aquarius for your sport fishing adventure. He professionally maintains all the tackle and gear. While you're enjoying your morning coffee he's sharpening hooks, retying knots, rigging baits and doing everything else that has to be done to make your day on the Aquarius one that you will always remember. While you're fishing the mate will help set the lines, adjust the drags, check for weeds, gaff the fish and keep you entertained by answering any questions you have about the boat or local fishing. As we head back to port, while you're resting from reeling in fish or enjoying a cold drink, the mate will fillet and package your catch. Whether you're an experienced angler or a novice, I know you'll find the mate on the Aquarius to be extremely helpful, personable, and polite. He's extremely adept with young children and whether male or female the mate will make you feel like a professional angler. At the end of the trip if you feel the mate was accommodating, it is appropriate to express your appreciation with a 20% gratuity.